I went and saw this at a free sneak preview and with about 5 minutes left to the movie about 20-50 people got up and left the theater. They walked out of a FREE SHOW EARLY! The movie is FAR from being bad enough to deserve that, but it’s still not very good. It was directed by Tony Scott, who I’ve never really been a fan of. If you’ve seen any of his other movies, such as “Man on Fire,” “Top Gun,” “Deja Vu” or “True Romance;” you know that he’s a big fan of making his films feel like a music video. They have random edits, bright colors and camera effects that don’t seem to make any sense (in this case he uses a lot of blurred lenses and freeze frame shots). But I will give him one thing, he does action very well. The problem is that this movie doesn’t have any. John Travolta is the charismatic bad guy and Denzel Washington is the reluctant good guy. These two character types show up in almost all of Tony Scott’s movies and he directs them well. I can’t give him too much credit on this though since this is a remake of a 1974 film which is based on a popular book by the same name. The fact that the movie is a talkie disguised as an action flick doesn’t bother me at all. It’s the fact that the story (which has been obviously updated a lot) doesn’t let me know how to feel about the characters. Hostages are dying, time is running out, the f-word is being screamed a lot, but there’s still time to crack jokes. The humor is all through this movie and it breaks up the tension, but it breaks up the tension too much and never gets a chance to build. And in a movie that only has tension to keep you interested, you got nothing left but good acting from great actors. Speaking of great actors, James Gandolfini plays the Mayor of New York City and steals the show in what would’ve been the most meaningless role for the film if John Turturro wasn’t in it as a hostage negotiator who serves even less of a purpose. However I do have to say that my favorite character was New York City itself. It made me miss it a lot. It’s the living, breathing force in the film that helps define all the characters in it. It sets the stage for the plot, the motive, the means, and the action…no matter how small the dosage is and how long you have to wait to get it. I don’t get it. When you take an incredible book, add Hollywood’s crowning jewel, mix it with one of the best working directors out there, the end result should be amazing. Why isn’t it? Where do these movies based on Dan Brown’s Best Selling series go wrong? To be fair, everyone crapped all over “The DaVinci Code” and I didn’t think it was as bad as they were making it out to be. And just like history repeating itself, the same thing is happening now with this one. To say that these are bad movies does a horrible injustice to them. They’re far from bad movies. But they don’t capture the excitement and pulse-pounding pace of the books. The complaints everyone had with “The DaVinci Code” was that it moved too slow and was too talkie. So what does director Ron Howard do about it? He made “Angels and Demons” move too fast and too talkie. 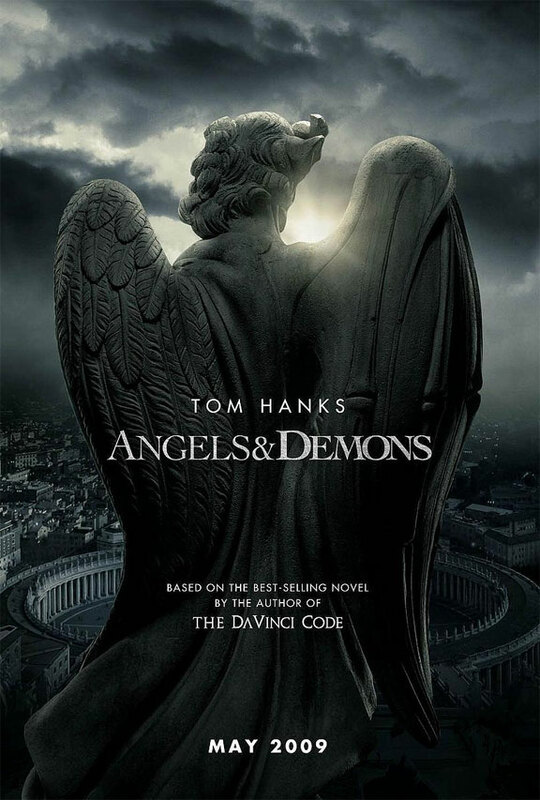 The good news is that “Angels and Demons” is better than its predecessor. The effects were better, the sets were amazingly accurate and, in my opinion, the story is better. But in its fast pace, I wonder if the story will be totally lost on someone who didn’t read the book. They worked so hard on pushing the action forward that they don’t let major moments sit and sink in with the audience in time. Of course the pace is moving fast until Ewan McGregor shows up on the screen. I don’t know if he was given a tranquilizer before shooting, but he’s phoning it in and talking like he just learned the language. Last time it was Tom Hanks who acted like that, so at least this time around we get a leading man with some blood pumping in his veins. I wonder if I would enjoy these movies so much more if I didn’t read the books. I certainly enjoyed the Harry Potter movies that I didn’t read more than the ones I did. Maybe the lesson learned here is don’t read books. Nah! I think the lesson should be that reading the books (especially in “Angels and Demons” case) is almost ALWAYS so much more thrilling and satisfying! And besides, it’s summer…aren’t you looking for a good book to read anyway? Bryan Singer was the director behind one of my favorite movies, “The Usual Suspects.” But he hasn’t gone back to those roots in a long time. I enjoyed the first two “X-Men” movies, but I longed for the spy/thriller feel again. I was hoping this would’ve been it, but it only kind of was. I feel like this was a movie that thought it was a lot more important than it really was. This isn’t a spoiler alert to anyone with half-a-brain, but the plot to kill Hitler (which is the basis of the movie) didn’t work. So in that respect, this true story really isn’t as interesting as you’d hope. You can’t get attached to the characters too much since you know they’re not gonna pull it off. But what is neat about this movie is to watch it and find out where their plan went sour. Another thing that’s cool is to play the “How Many Actors from the ‘Pirates of the Caribbean’ movies are in this.” I got up to 3, although you may not recognize Bill Nighy (he was Davey Jones)! I guess they were having a sale on slightly recognizable British actors. Which brings us to Tom Cruise. Why he’s in this is beyond me. It’s not that he was bad, but he wasn’t great either. That’s the story of his life. He’s the guy you call when you just want to get the job done. He sticks out like a sore thumb in this as the ONLY non-British person in it. But overall, he’s still fine at what he does and that’s kind of par for the movie too. It’s fine for what it does.